For March. Bev Drew Kindley, en plein air artist. 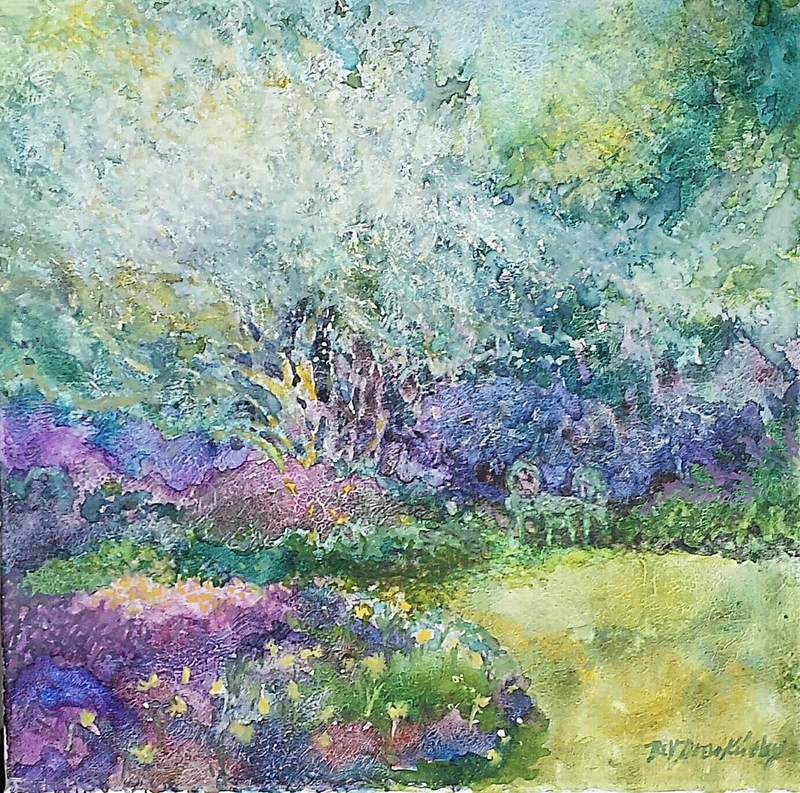 “Joy Of Spring”, 12 x 12 watercolor on textured gesso canvas. 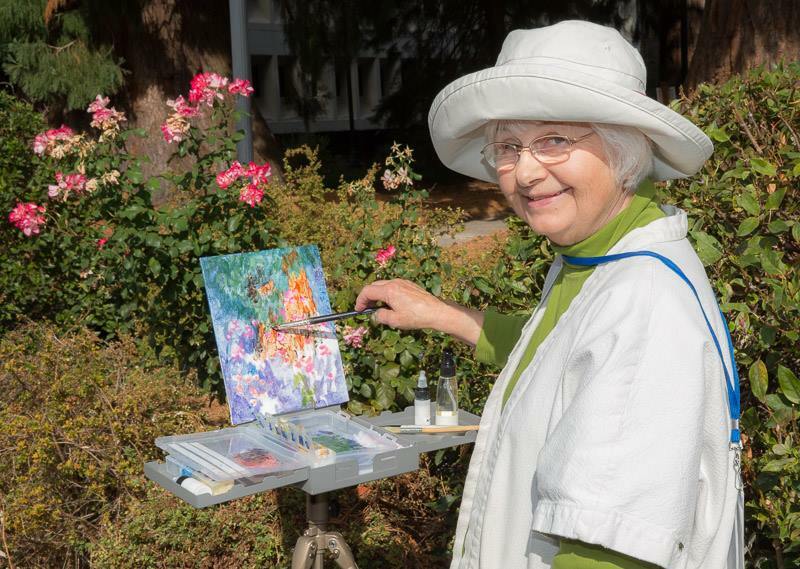 Bev Drew Kindley, en plein air artist. “Reaching For The Light”, 10 x 8 watercolor on gessoed board. Painted on site. Crystal Springs garden. “Waiting For Spring” , 8 x10 watercolor and acrylic on gessoed board. Happiness is being outdoors absorbing nature– watching, waiting, sensing, and beginning to notice the poetry of the flow of shapes and colors, the grand design. Next best are my many reminders and memories of the beauty seen and felt. A strong wish to share observations leads to ideas, sketches, and choices. 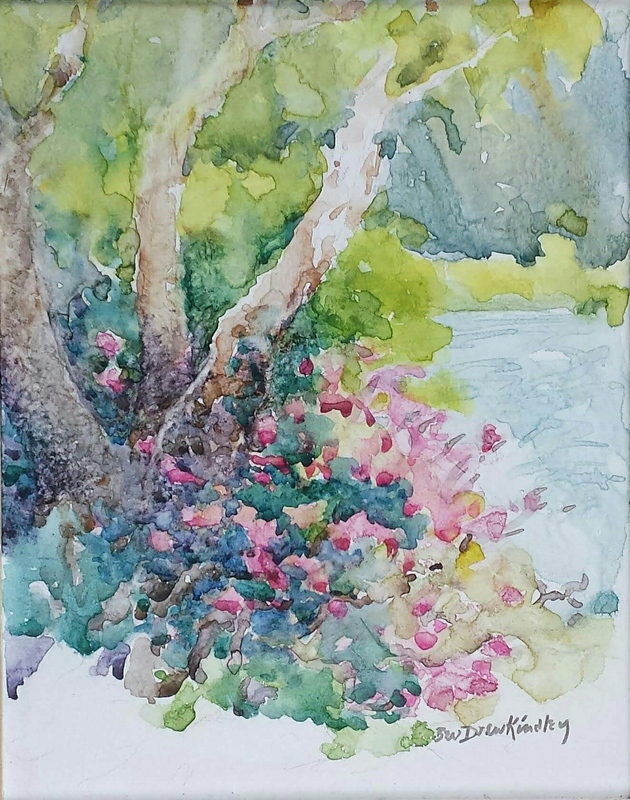 Sometimes I may feel watercolor best expresses the mood with its depth of color and independent ways of spontaneously creating shapes and textures suggesting nature. I have learned to “Let IT do IT”, meaning to allow and appreciate the ways of water with pigment while gently modifying to strengthen the emerging theme. Watercolor on gesso-primed board or canvas gives more possibilities and can be varnished for protection. Sometimes varied layers of acrylic paint as well can create intriguing depth and texture. My paintings can be reminders to you of how refreshing it is to let intuition and experimenting be your guide. 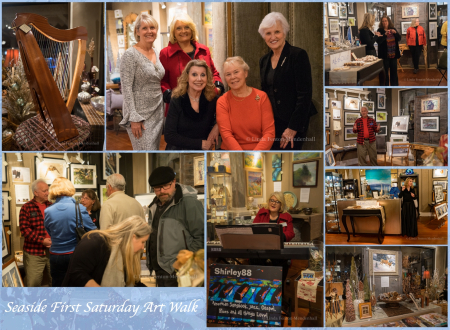 Celebrating 15 years in 2019, Seaside First Saturday Art Walk is free and is open to the public. 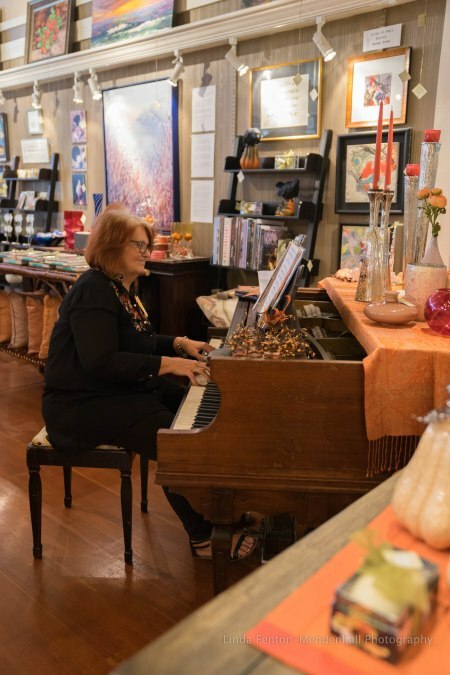 The Art Walk is all about seeing art in the galleries and boutiques located between Holladay Drive and Broadway Street in the Historic Gilbert District of downtown Seaside. Visitors meet artists, snag appetizers by favorite restaurants or personal chefs, view painting demonstrations, listen to artist’s talks and, oftentimes, enjoy live performances in music. Habitat lecture by local naturalist Neal Maine at 6:pm. “I’m a native Oregonian who paints to understand, and enjoy the inspiration of unique moments of light and weather. My impressionistic works of art are to viewed as visual celebrations, connecting with light, color, form, texture and design. It’s my way of communicating with the world. My hope is to encourage appreciate and protection of our heritage and world. Learning to paint has been an on-going process since I first began drawing, with further education from Portland State University, Portland Community College and individual workshops…I have been always curious and fascinated with the power of the individual to create. 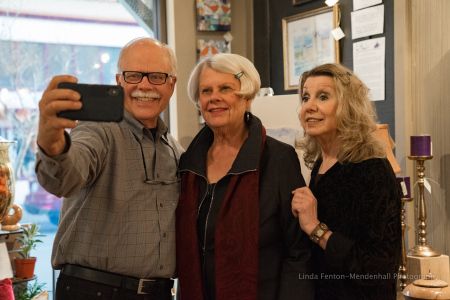 Exhibiting throughout Oregon, as well as, painting the coastal areas, has encouraged my productivity and experimenting with different medias– oil, gouache, watercolor, pastel and others. I have taught painting classes and worked in the art business for quite some time. 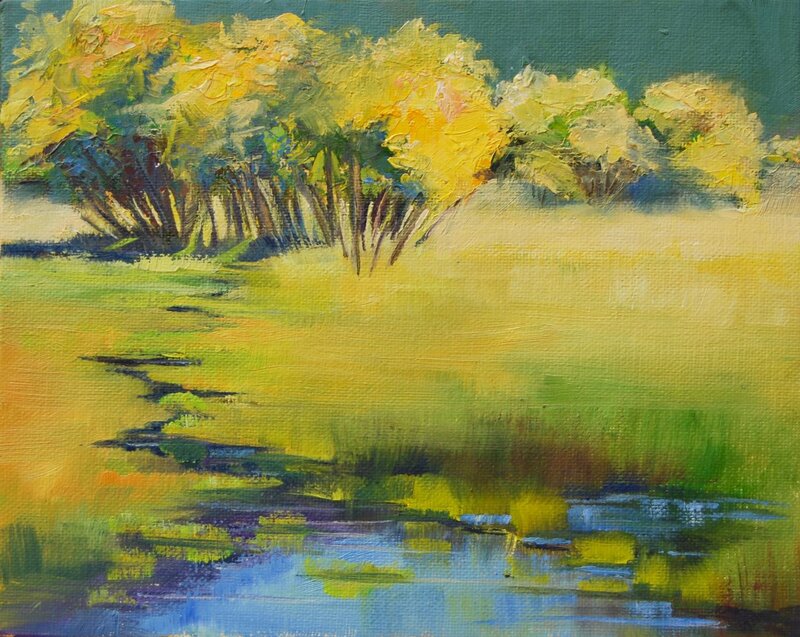 At present, my greater enthusiasm is painting “en plein air”, a French term, meaning to paint working outdoors, and capturing the light without a short time frame because of the immediacy of the experience, as well as, the abundance of visual information along with the possibility of sudden breakthroughs in methods due to improvising. Sacred. 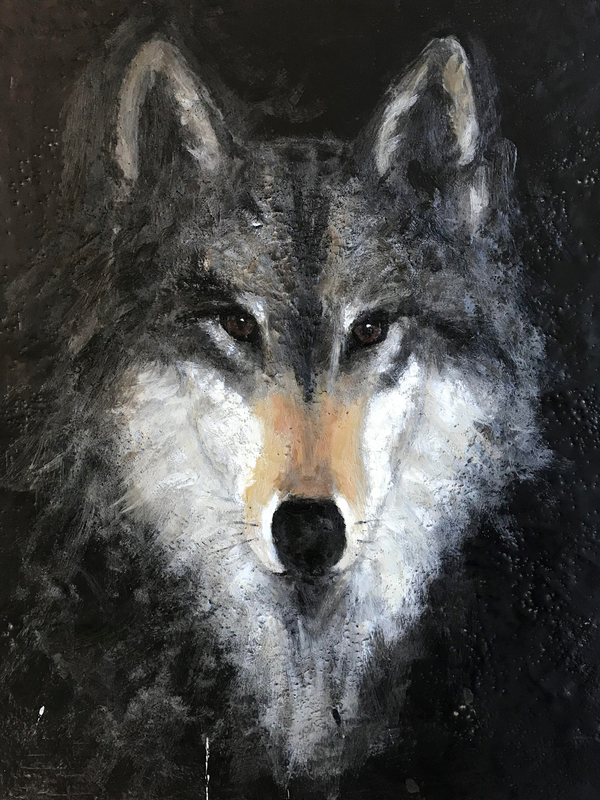 Encaustic wolf by Gregory Bell. Sacred. Encaustic (beeswax) on wood panel by Gregory Bell. A federal agency and five conservation groups have put together a reward totaling $15,500 for information on the illegal killing of an Oregon wolf in Klamath County. The wolf, OR-33, died of gunshot wounds in late April but the case was not confirmed until October following tests on the wolf’s DNA. The wolf’s carcass was found about 20 miles northwest of Klamath Falls in Fremont-Winema National Forest, U.S. Fish and Wildlife Service officials said. “This is a heartbreaking loss for Oregon’s wolves,” said Amaroq Weiss, West Coast wolf advocate at the Center for Biological Diversity, one of the groups that contributed money. OR-33 was a 4-year-old male gray wolf that dispersed from northeast Oregon’s Imnaha Pack to southwest Oregon, where he became well known. He was seen by multiple residents, and his photo was captured by a hunter’s trail camera near Emigrant Reservoir, about six miles southeast of Ashland. 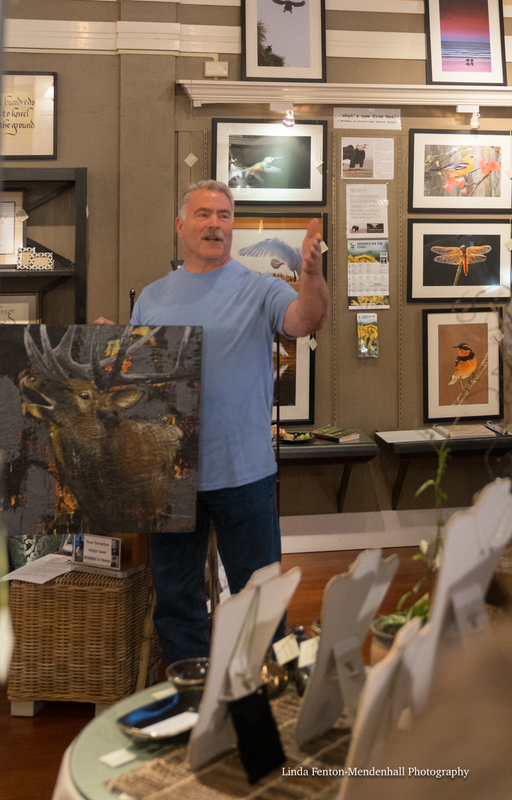 During the opening reception of SHADOWS, Gregory Bell offered an artist talk about the encaustic works depicting the wildlife found in coastal habitat of the area. 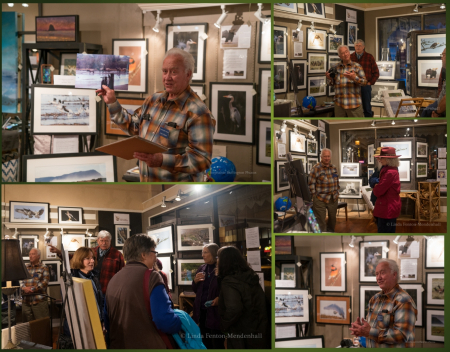 At the opening reception of SHADOWS on October 7th there was an auction of selected Neal Maine images. More than $300 was raised in less than five minutes to benefit the WCNC!!! 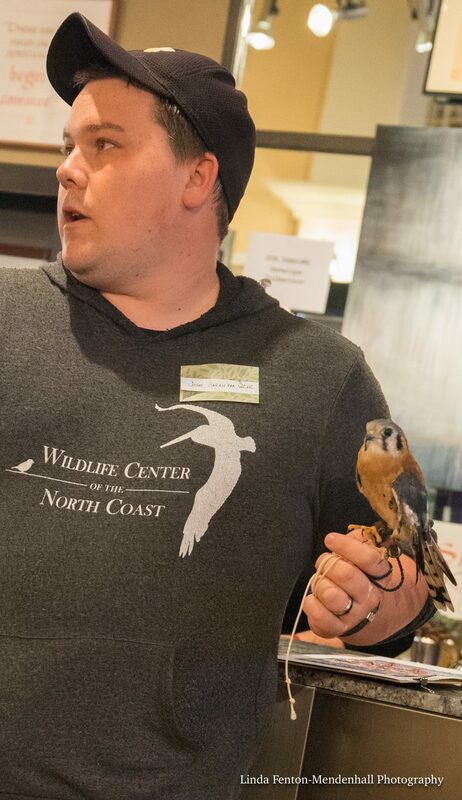 Wildlife Center of the North Coast (WCNC) is a 501(c)(3) non-profit Oregon corporation, that specializes in wildlife rehabilitation of resident and migratory birds, mammals and other wild creatures naturally occurring in Oregon. 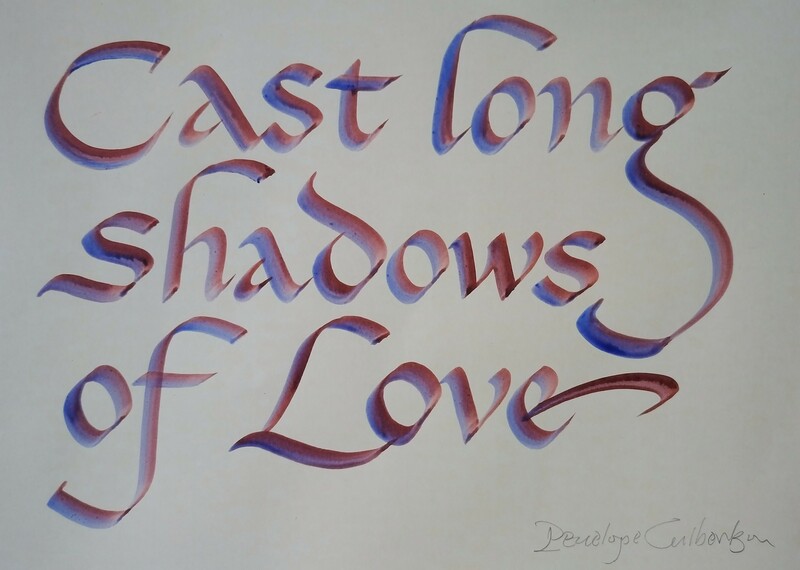 For SHADOWS original calligraphy by Penelope Culbertson. Imagine quote by John Lennon created in calligraphy by Penelope Culbertson. Shadows quote by Penelope Culbertson. Penelope teaches weekly classes in calligraphy and watercolors for the disabled. She experiments in watercolors, oil pastels, collage, tapestry weaving and calligraphy. She is a member of the Portland Society of Calligraphy. 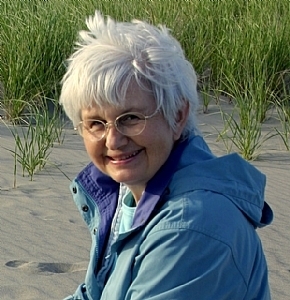 She exhibits her art at Fairweather Gallery in Seaside, Oregon. 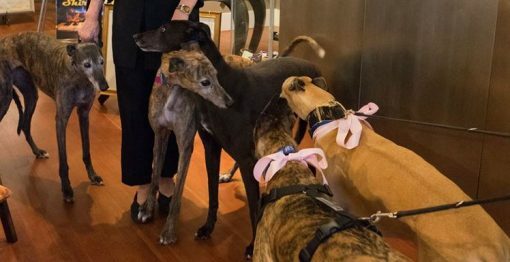 In Penelope Culberston’s calligraphy class at Reed College there was a fellow student, Steve Jobs (Apple computer founder). 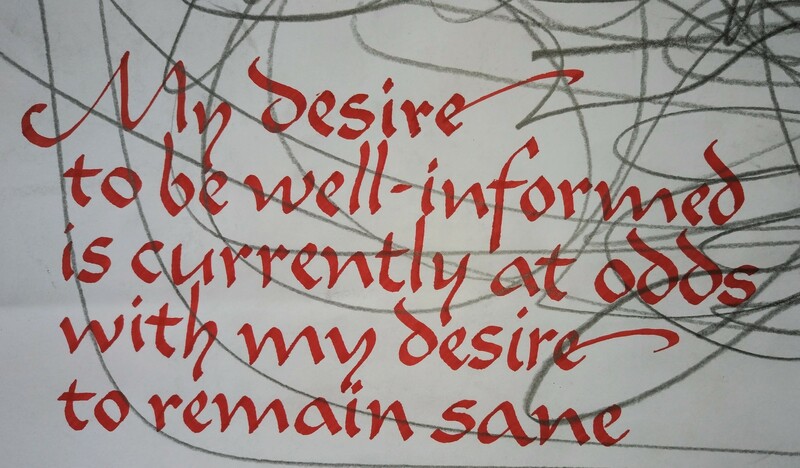 There is a theory that the computers today would not have the font choices without the learning seed planted by Reed College calligraphy professor Lloyd Reynolds. 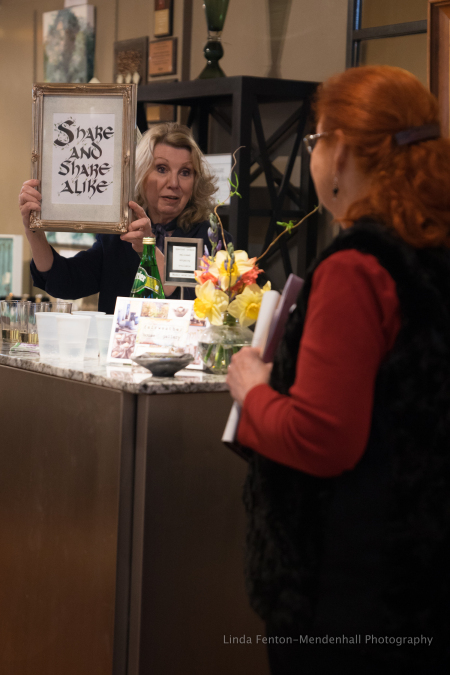 Penelope Culbertson, at the opening reception of SHADOWS on October 7th, in addition to offering a scribing LIVE episode, will offer an artist’s talk about significant quotes that have made a difference in tilting the world to a better place!!! 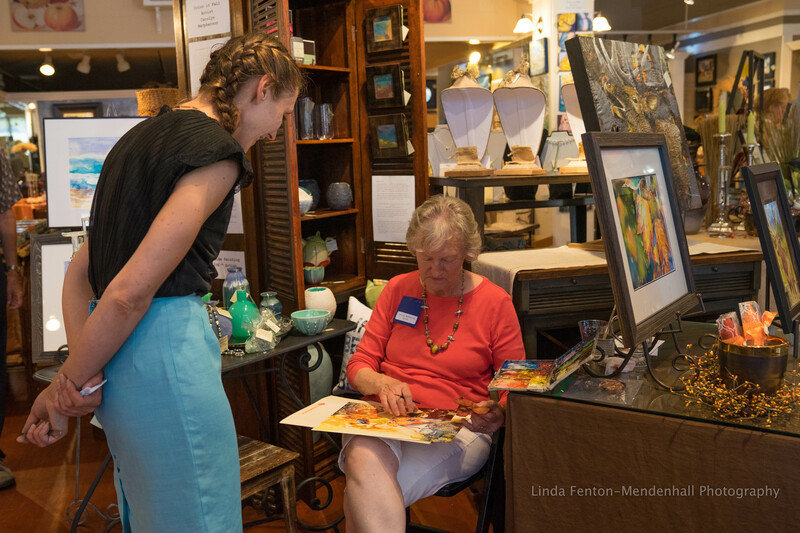 Visitors meet artists, see original art, sip wine or snag appetizers by favorite restaurants or personal chefs, view artist demonstrations and, oftentimes, enjoy live performances in music. 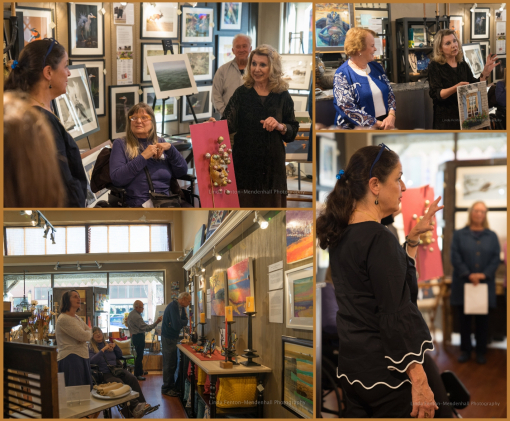 The event is free and is all about seeing and selling art in the sponsoring galleries and boutiques located between Holladay and Broadway in the historic Gilbert District of downtown Seaside. Complimentary parking for the historic Gilbert District is on the corner of Holladay and Oceanway. Opening reception for SHADOWS, an exhibition that focuses on the interplay of light and dark through selected art that expresses time as the fall season progresses. New artwork by Northwest artists Diane Copenhaver, Penelope Culbertson, Gregory Bell, Lisa Wiser, Karen E. Lewis, Tamara Johnson and Marga Stanley will be featured. Artists will be in attendance to meet patrons and to speak about their art. Calligrapher Penelope Culbertson will offer her annual Fairweather scribing LIVE episode! 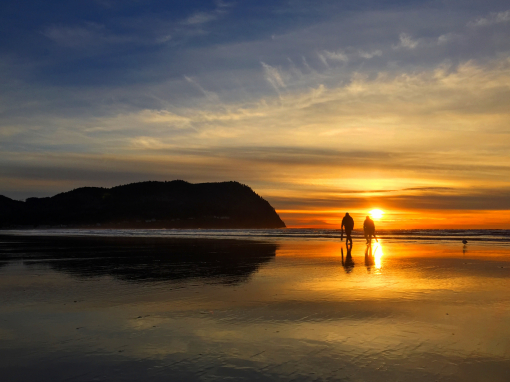 Seaside/ Gearhart naturalist Neal Maine will speak at 6: pm about the autumn ecology of the local habitat. SHADOWS, the opening reception for Fairweather’s October exhibition, will be a benefit for Wildife Center of the North Coast! Welcoming Lisa Wiser to SHADOWS, Fairweather’s October exhibition. Lisa Wiser is a visual artist living and working in Oregon. 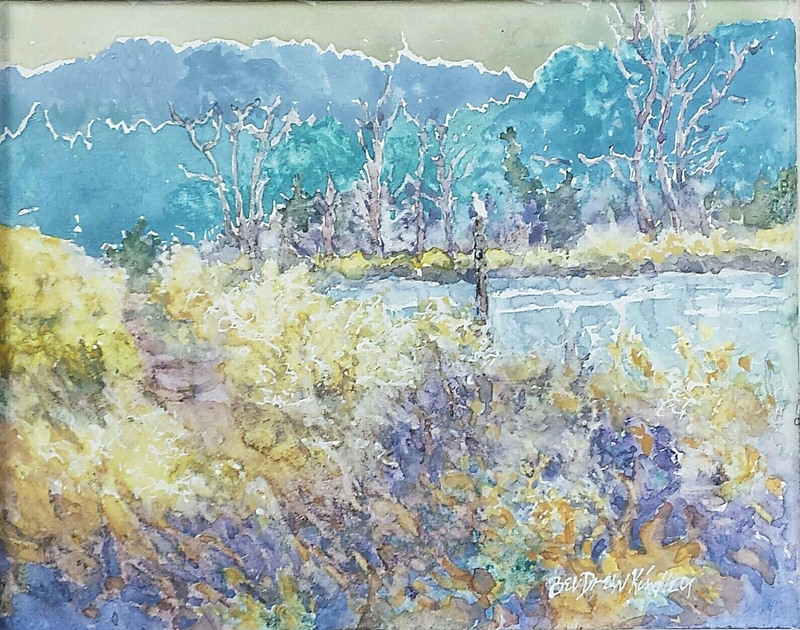 She draws inspiration from the scenic northwest, travel adventures and reading novels to create watercolor, acrylic, and mixed media paintings. Also an avid photographer, she chronicles her visual inspirations as she records obscure landscapes, architectural details, and other intriguing painting subjects. Pursuits in life drawing and plein air painting confirms that she prefers a direct association with her subjects while working from life both outdoors or in the studio. 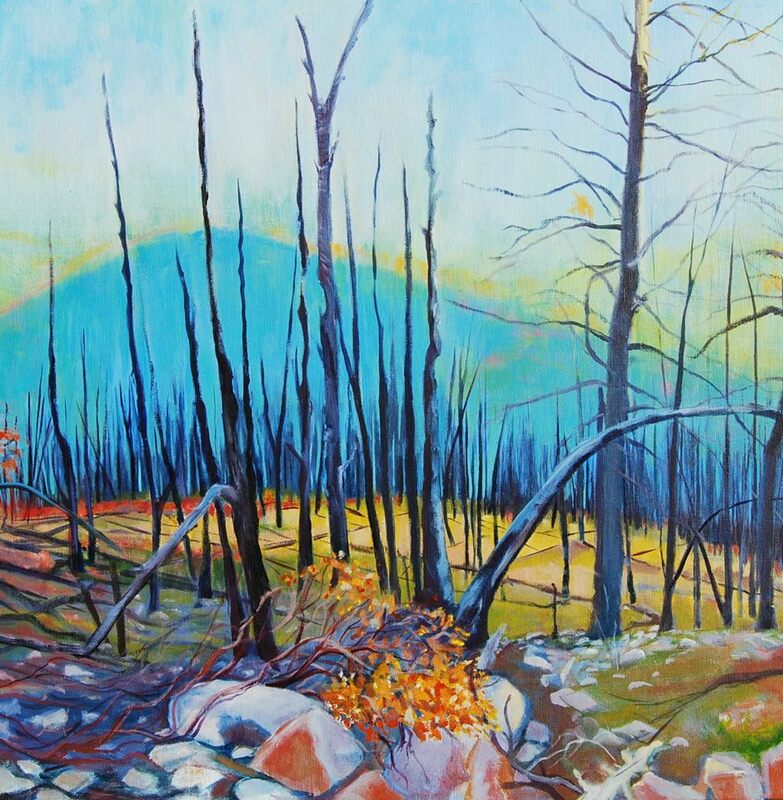 Her representational work is characterized by vivid color, great depth of space and attention to detail. 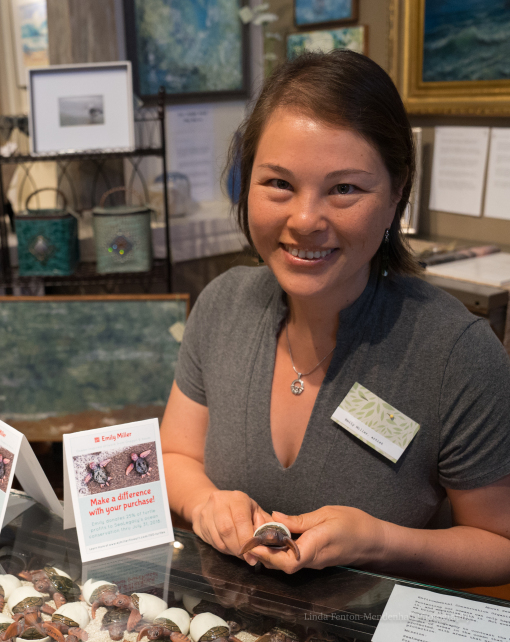 Lisa earned a BS Degree in Art Education from the University of Oregon and has completed graduate coursework in graphic design, art education and painting. Lisa has been invited to serve in both curatorial and juror positions for various arts organizations in the area. 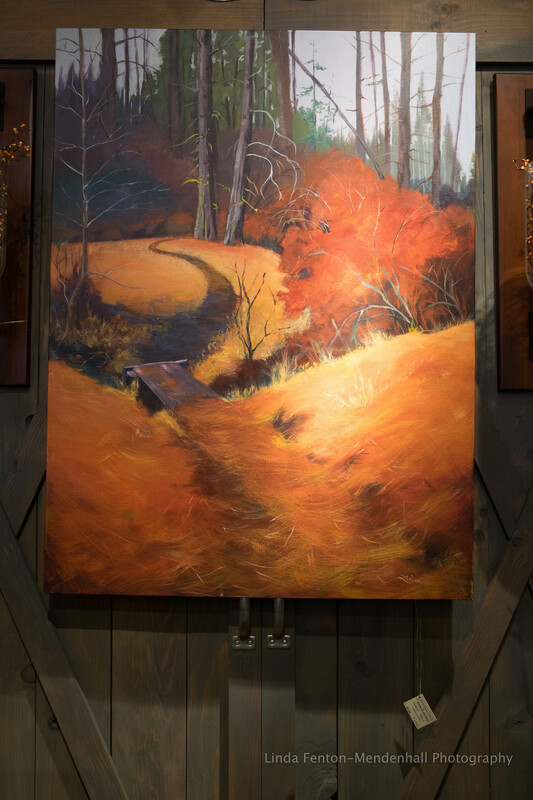 She has taught art from pre-school through college and adult level courses and has recently retired as a substitute art teacher for her local school district to devote more time to her painting. Aside from painting Lisa enjoys hiking, reading, gardening, skiing, and family time with her three adult children and husband, travel and fixing things. Her favorite getaways are the forests and deserts of Central Oregon and her family’s rustic retreat on Payette Lake in McCall, Idaho. Opening reception for SHADOWS, an exhibition, Fairweather House and Gallery. Introducing glitter house artist Tamara Johnson. SHADOWS will feature new artwork by Fairweather resident artists Diane Copenhaver, Gregory Bell, Whelpsy Whelp, Marga Stanley and Neal Maine. Featured artists will be in attendance and will offer an artist talk about their works of art. 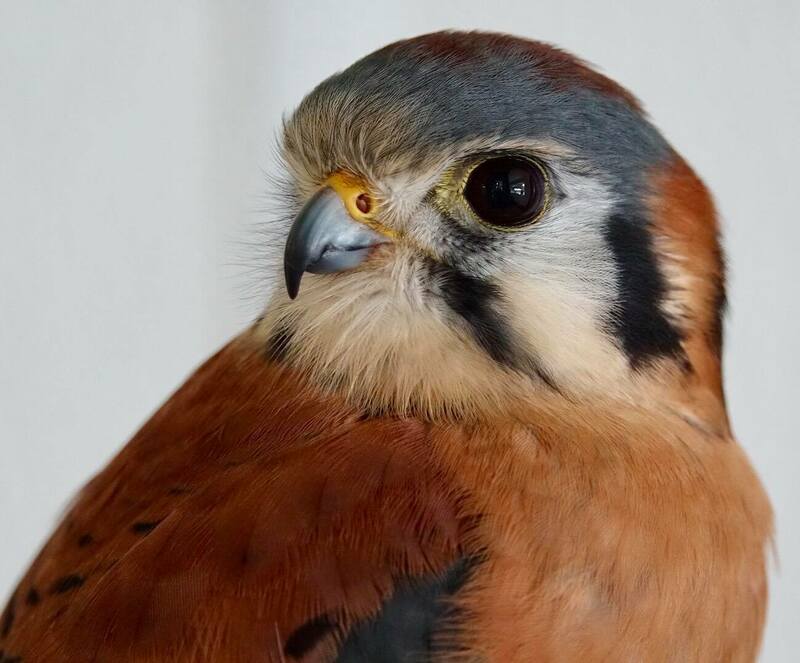 Special guest, FLYNN, an American Kestrel, from the Wildlife Center of the North Coast. SHADOWS, the opening reception, will be a benefit for the WCNC. 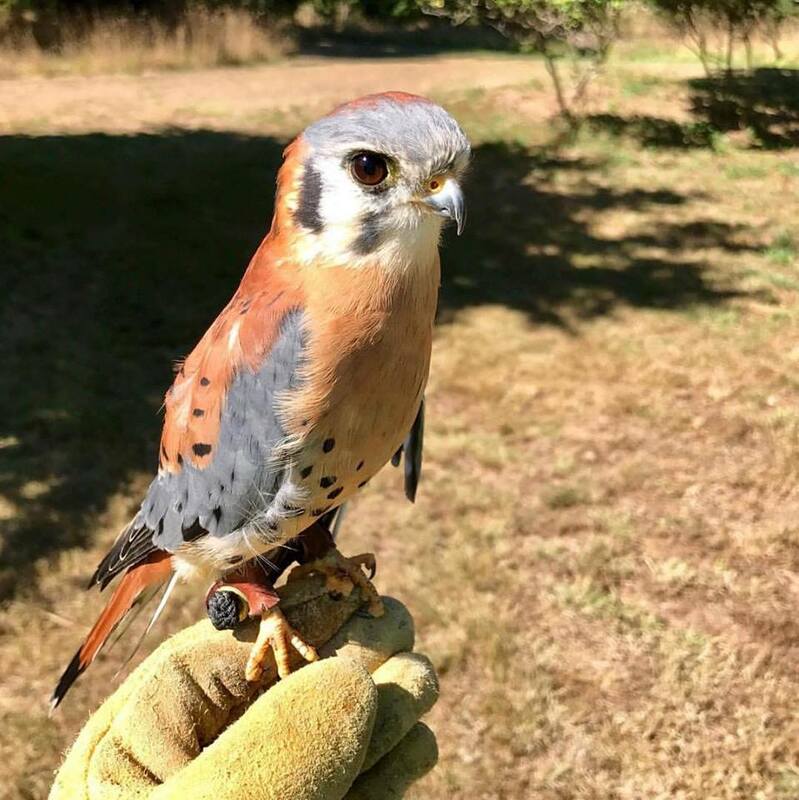 Wildlife Center of the North Coast (WCNC) is a 501(c)(3) non-profit Oregon corporation, that specializes in wildlife rehabilitation of resident and migratory birds, mammals and other wild creatures. WCNC relys on the generosity of individuals and community groups for annual funding through donations, as well as grants from foundations, both local and from around the country. 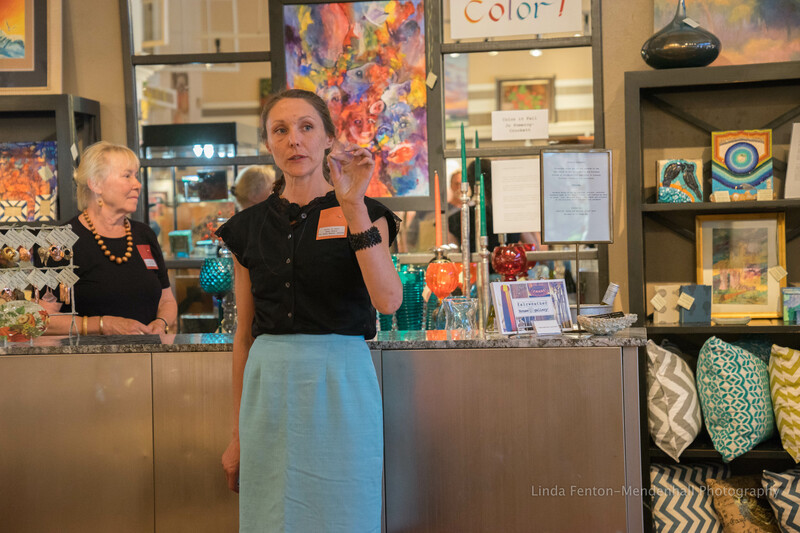 Anny Sears for Mike Mason, offered an artist talk during the opening reception of COLOR IT FALL. Anny Sears, fellow floral artist, spoke about the understanding of florography and how it magnified the energy of Mike Mason’s art. 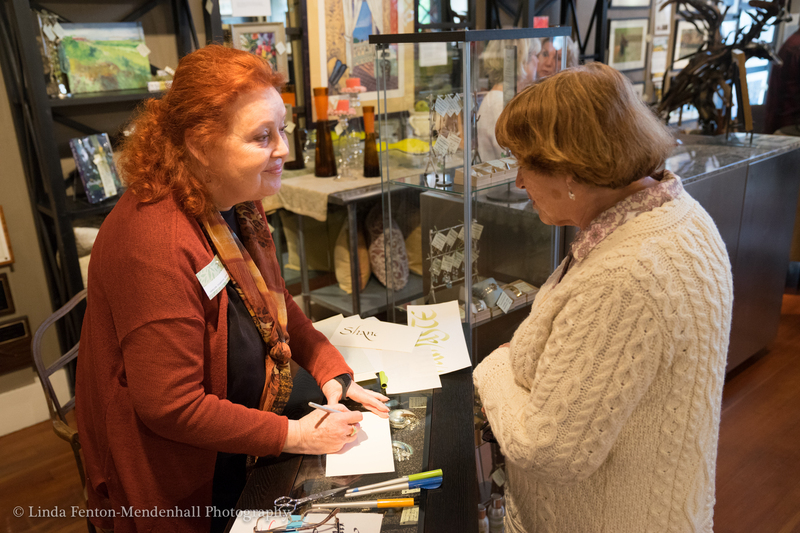 Anny Sears visits with artist Carolyn Macpherson, who offered a Seaside Painting LIVE ™ episode during the opening reception of COLOR IT FALL at Fairweather’s on Sept. 2nd. This image is of a 9 point star. It is a symbol of faith. The back ground is composed of hydrangea representing: devotion, and remembrance. Queen Anne’s lace, historically representing: haven, protection, and “I will return”. Cosmos line the star. They represent: modesty and love of a virgin. Rhododendron signifies romance, first love and moderation. Tulips accent the stat points with perfect love and “happy years”. 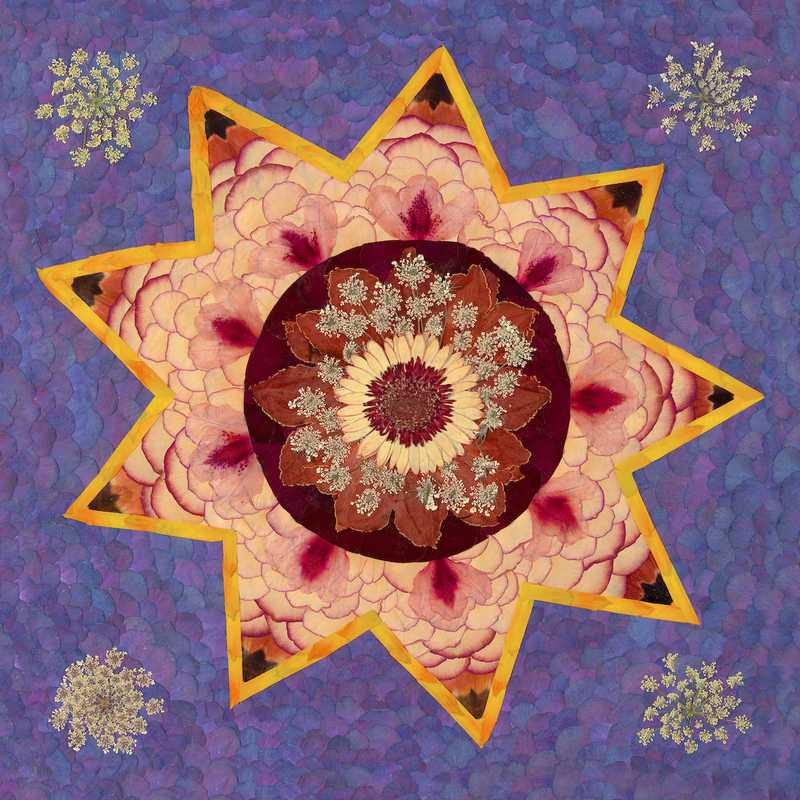 The center of the star is a Gerbera daisy. Historically the flower represents sadness. This part is special, because the emotional heart is one that we all share. Examining ones center and letting it bloom is truly the origin of Love. COLOR IT FALL, an exhibition, through September 2017. Light, sun and moon art by NW artists sponsored by Fairweather’s. 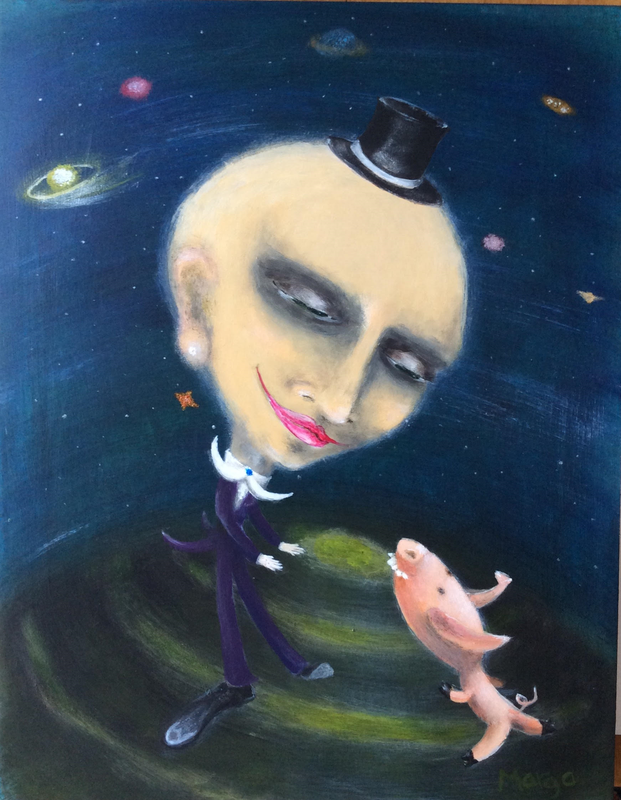 Dancing With The Stars by Marga Stanley. 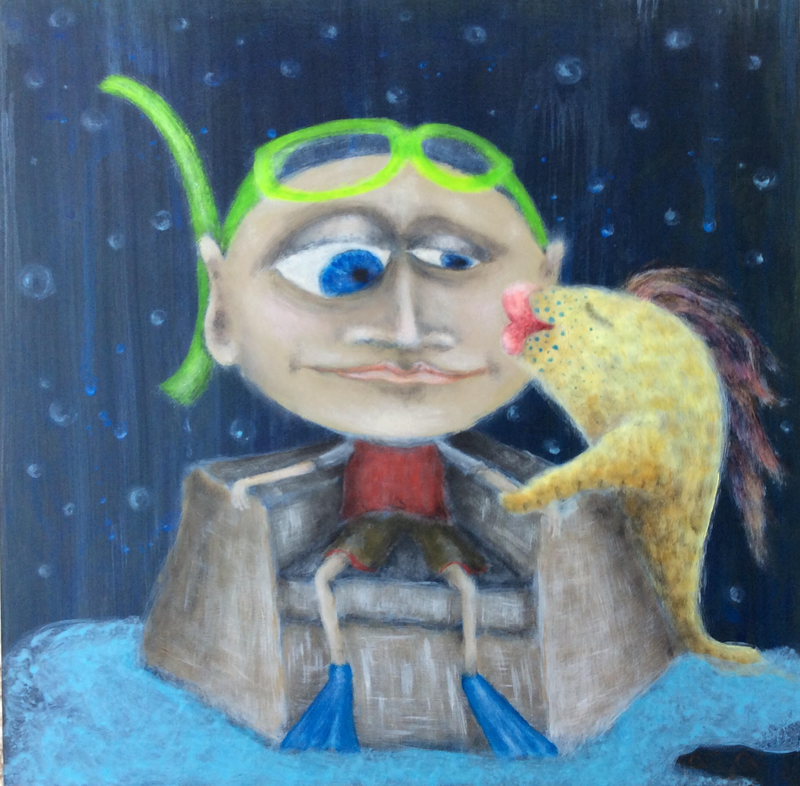 The Snorkler by Marga Stanley. 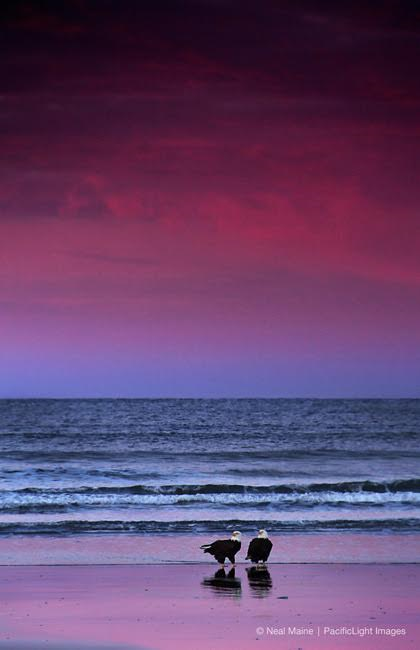 Eagle Sunrise by Neal Maine/ PacificLight Images. Seaside clam tide by Linda Fenton-Mendenhall. The summer art season ends with a most perfect exhibition titled COLOR IT FALL. New original art compositions revolve around the complementary clash of the deliberately heightened blues, bright oranges and warm yellows. 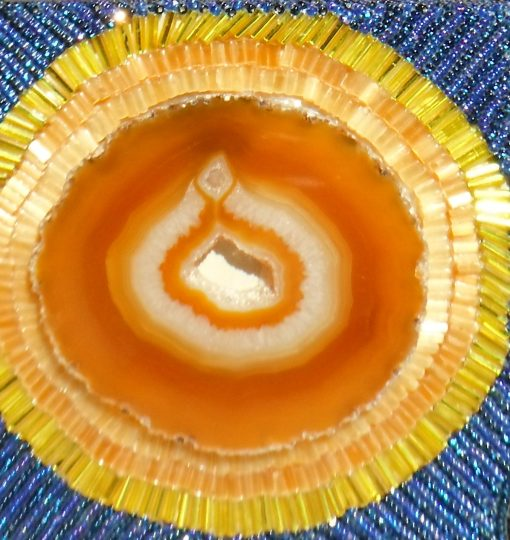 Color is the dominant element in new art by resident artists Jo Pomeroy Crockett Ph.D., writer and artist, bead artist Gayle H. Seely, abstract painter Renee Rowe, Dr. Dale Veith, Paul Brent and Lisa Wiser! Introducing prize-winning artist Mike Mason, who uses carefully dried, pressed and placed botanicals to create art to support natural habitats conservation. 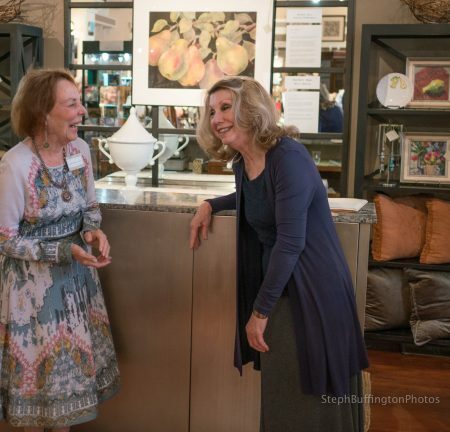 In addition, welcoming new NW Cathy Mahardy to the Gallery. Naturalist, scientist and biologist Neal Maine will speak at 6: pm about the ecology of the local habitat.